Drywall finishing can make the difference between an “okay” finished wall and a spectacularly finished wall. There are 5 different levels of drywall finish available. The standard drywall finish used on a custom home is Level 4. This finish includes a sanded coat of tape plus mud on all joints and is acceptable for applying most types of low gloss paints in areas with normal levels of light. Level 5 is the next and highest possible level of drywall finish. This premium finish is a fully sanded skim coat of the entire wall leaving the surface mirror smooth. Think of it as the icing on the cake! In a perfect world, this would be the standard finish but because of its cost and high degree of difficulty, this finish is not commonly seen. At Caledon Build, we love this finish and we recommend Level 5 for all ceilings and any open areas near large windows. This usually works out to 35-50% of the total wall area. PRO TIP: This finish requires a highly skilled craftsman. You’ll know you’ve hired a master drywall contractor if they use a flood light during Level 5 sanding. This is used to highlight and cast shadows on any bumps or slight imperfections not visible in normal ceiling light. 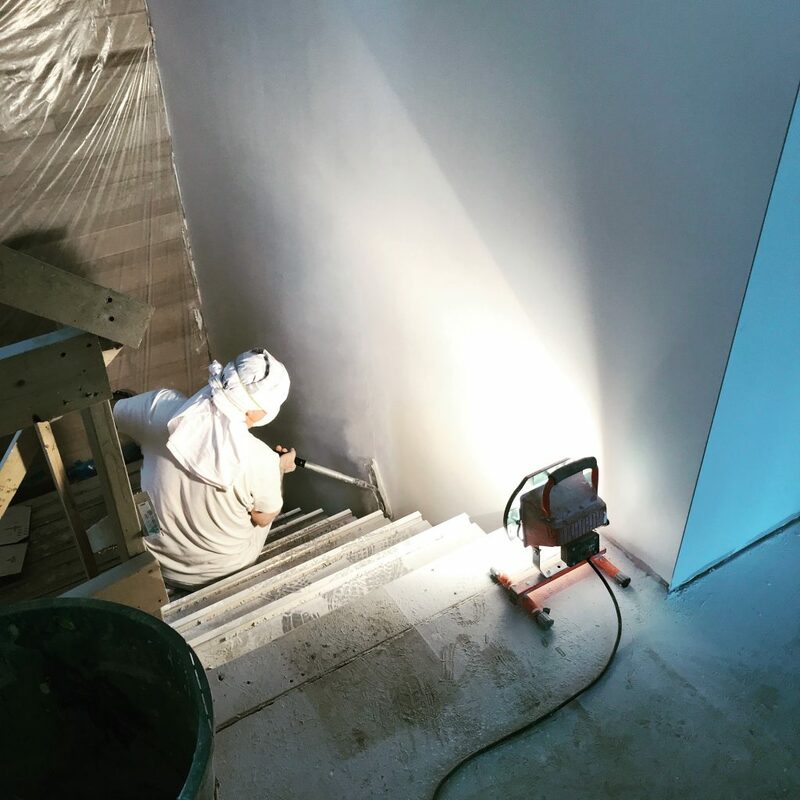 Here is a shot of one of our team members at our build in Etobicoke where a flood light is used during Level 5 sanding. Attention to detail is key!